"I feel super fortunate to own this bass, but I must admit many of the details are a complete mystery to me. I am pleased to have been so lucky to find such a great example in this Urge I bass. I am proud to play it, but I do wish the medium scales were still available." FENDER URGE I - PROTOTYPE? 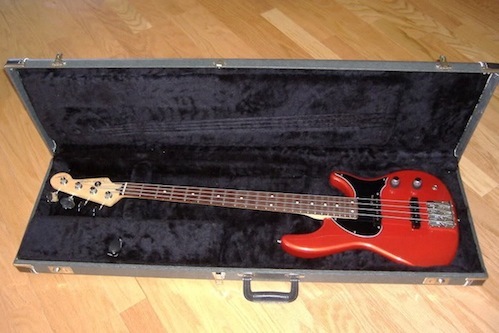 As far as I know, this is a rare original Fender Urge l - sometimes called the MX model bass, made in Mexico - but I have to wonder if it's some kind of prototype or something. I bought it second hand on Ebay and the original owner swore that the electronics and controls were all original. I have had a few guitar experts examine it and they have all agreed - everything appears to be factory original. The pickups are the active EMG's which sound great. Unlike any other Urge l model I have ever seen, this one simply has volume one, volume two and tone, like a regular Jazz Bass. There are no stacked controls and the input jack appears on the body edge like most basses. As you can see from the photo below, the commercially produced models of the Urge I had the jack mounted right on the front of the body. All of the early Urge l models I have seen also have "stacked" tone controls like this one. From Wikopedia: "There was also a short-lived Urge Standard which was made in Mexico between 1993 and 1999, featuring a medium 32" scale length, two standard Jazz Bass pickups and passive circuitry with dual concentric volume and tone for each pickup." With this in mind, I have no idea what is up with the standard jazz bass controls on this bass. Also my EMG pickups - which appear to be factory installed - are active, not passive. It is also very odd about the location of the input jack. If anyone has any further thoughts or has any explanation for this I would love to find out more. Has anybody even seen another bass like this one? Aha - NEWS FLASH - I have been in touch with John Page of John Page Guitars, who worked for years at Fender and was the production guru assisting Stu on the Fender side with the design and build of this Urge I model. He was also the creative force behind the Fender Performer bass as well. After taking a look, John told me that yes, this was either an early prototype of the original Stu Hamm Urge I, or else it could possibly be a special employee build. As you might suspect, a lot of the guitar manufacturers allow the employees to do one-off designs based on many of the production models. It could fall into this category, but either way, it is certainly a one-of-a-kinder. I am not sure of the body wood, but it feels so light I am thinking basswood - but according to the manufacturing notes I have read, they were apparently made of poplar or alder. I absolutely adore the neck - definitely a personal favorite - and it keeps me coming back to this instrument time and time again. As far as I know, it's the only 24 fret, full two-octave medium scale production neck ever made by Fender. It is maple with a mahogany stripe and it has a beautiful pau ferro or rosewood fingerboard. Again, looks like a fine piece of rosewood to me, but the manufacturing notes I have read say the fingerboards on these models were pau ferro. 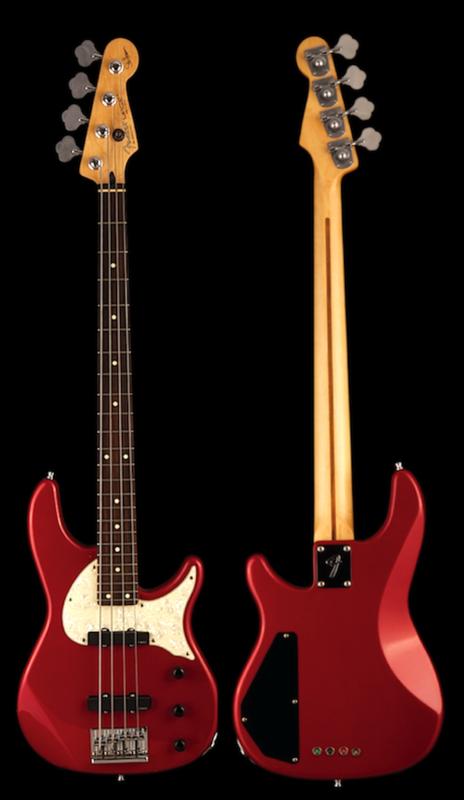 Disappointingly, the Fender Urge II basses now have full size 34" necks. This bass sounds great - bright but a nice round bottom - and I keep round wounds on it. As a side note, Happy the Man's second drummer, Ron Riddle, toured with Stu Hamm in the early 1990's - around the time this bass came out. I saw the tour and Ron and Stu were definitely a delightful rhythm section and Stu's Urge I sounded great!! This is a Fender Urge I model - sometimes known as the Urge MX - is a bit of a mystery. It is medium scale, with a full 24 fret two octave neck. It was designed by Fender in conjunction with Stu Hamm in the early 1990's, and built at the Fender manufacturing plant in Mexico. It weighs in at 7.4 lbs and the width of the neck at the nut is 40.4 mm. I can't be sure of the body wood, but I am told it is more than likely a poplar or an alder body, with two active jazz bass style EMG pickups. Again, I am told it has a pau ferro fingerboard with standard size frets, but it could be rosewood. The neck is maple with a mahogany stripe down the back and is bolted on using the traditional four bolt system. There is no neck tilt adjustment on this model and the tuning machines appear to be standard Fender bass issue. There is a string post for the G and D strings. The bridge appears to be the standard "strings though the body" Fender bass bridge. This instrument is most certainly collectible and will more than likely be the only two octave Fender production medium scale neck you will ever see. 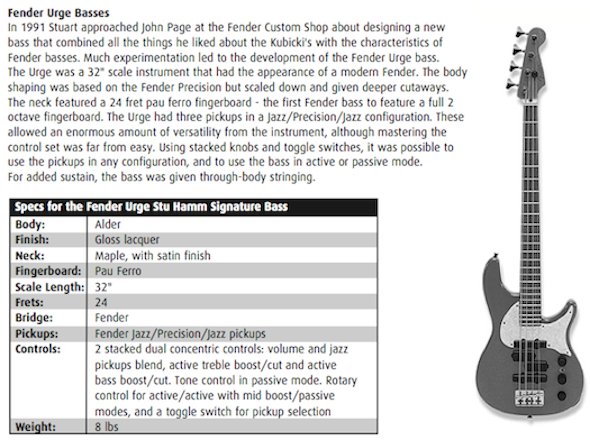 Here are some published specs from Fender - please note that not much of the information listed about the electronics agrees with the features of the bass above.